One of the things I’ve always liked about The Tempest is that it seems to start in the middle of the story. The titular storm that brings a particular group of people to a particular island is the turning point in their fate, as the wronged and usurped Prospero exerts his influence on the natural world. This means the opening scenes are heavy with back-story, but it’s all about setting things up before the final confrontation and moment of forgiveness and reconciliation. Like the bear in The Winter’s Tale, how the opening scene will be staged is always eagerly anticipated. David Farr’s production, part of the RSC’s ‘shipwreck trilogy’ uses the same diagonal planks, the decking of a ship, to fill the performance space (and indeed the same cast) as Twelfth Night and the Comedy of Errors. Prospero’s isle is rather drab and monochromatic. His ‘cell’ is a Perspex box and it is in here that the tempest happens. Sitting at her schooldesk, Miranda (Emily Taafe) listens with growing fascination to the voices of the passengers and crew while behind her, in the Perspex box of her imagination, we see the scene played out within those cramped confines. It’s a neat idea but hardly spectacular. The Perspex box has things in common with the TARDIS – it can transport characters – and the holodeck on the USS Enterprise – it can show things – but I couldn’t help thinking of Philip Schofield’s game show. Can you beat The Cube? Prospero (Jonathan Slinger) stalks around in a stained suit and buttoned-up shirt. 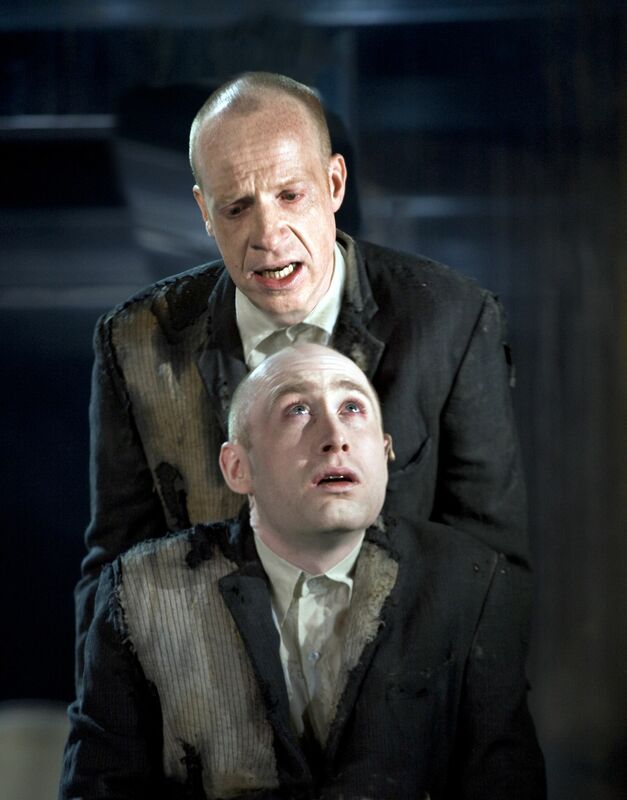 And so does his spirit slave Ariel (Sandy Grierson in a hypnotic performance) – a kind of Mini Me, who happens to be taller than the original. I liked this identification of slave and master and of course, off comes the jacket at the end when Ariel is awarded his freedom at last. Trouble is, I could neither warm to this Prospero nor marvel at his powers. There is something about Slinger’s characterisation that prevents this. Technically he is an excellent actor but I just wasn’t getting it. Caliban (Amer Hlehel) wears a suit that is little more than a collection of tatters. A dust cloud arises whenever he moves and he has an enjoyable manner of cursing and swearing. His supposed ‘misshapenness’ is nothing other than his different ethnicity, bringing to the fore the play’s themes of imperialism and colonialism. Caliban is quite right to be aggrieved, in modern eyes, but perhaps to the Jacobean viewer, he would come across as the ungrateful savage. Why is his usurpation acceptable but not Prospero’s? (I’m loving the chance to say ‘usurpation’ and I may well do so again before this review is finished). Solomon Israel’s Ferdinand brings the first note of physical humour to the play. His arrival is a breath of fresh air and his interactions with Taafe’s Miranda are delightful. When he is enchained by Prospero, the slavery theme is starkly with us – I don’t think this was an unconscious side effect of the ‘colour-blind’ approach to casting. The always-enjoyable Felix Hayes gives an endearingly dim Trinculo and Bruce Mackinnon’s Stephano gives a drunken satire of the imperialist. Their scenes with Hlehel’s Caliban liven up this production. The second half has more oomph. At last we see Prospero calling up the special effects department to do his bidding. We get flashes and bangs and dry ice and bubbles. The isle has become a magical place at last. As Prospero realises that forgiveness is his best option, he becomes less the stern plantation owner and nasty schoolteacher and more the sentimental father and big-hearted brother, accessing all parts of his humanity and choosing tbe better ones. Slinger wins you over by the end. I liked Nicholas Day’s dignified Gonzalo but I don’t see why Sebastian (Kirsty Bushell) was made a female character but referred to as male most of the time. Her Sebastian is sardonic and cool, a counterpoint to the blustering of the rest of the party. There are some great touches: I liked Caliban carrying firewood like Christ bearing the cross, and the Caravaggioesque freezes when Sebastian and Antonio are about to carry out their violent usurpation (there you go) of Alonso. Perhaps it’s my fault for wanting more enchantment but, like drying out after a downpour, I came to like this production a lot by the end and found it ultimately moving.